Would AMC and OLTL Actors Come Back?! Yes, They Would!! Fans of “All My Children” (AMC) and “One Life to Live” (OLTL) take heart! There’s more encouraging news about revivals of those iconic ABC soap operas. 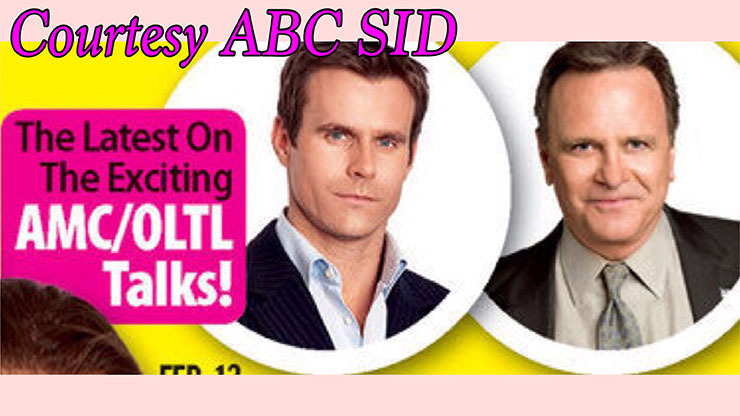 Several ex-AMC and OLTL actors confirmed their desires to reprise their fan favorite characters, their portrayers told ABC Soaps In Depth (SID) in its February 13th print edition. The incomparable Jill Larson echoed a similar sentiment about once again portraying the wacky Opal Cortland. “To be reunited with Opal would be like encountering a beloved, long-lost friend,” Larson said. Ilene Kristen has spoken before of her love of OLTL and her character on it, Roxy Balsom. “Of course!” the soap vet said of returning to the dramatic hamlet of Llanview. Teri Conn (Aubrey Wentworth) expressed delight at the prospect of revisiting the character she made a Llanview staple. Robert S. Woods (Bo Buchanan) and Brittany Underwood (Langston Wilde) spoke of their affection for their OLTL characters as well. “I’m glad to know our characters may still be alive…out there somewhere,” Woods said. Soap Cities has written of all the exciting evidence piling up that AMC and OLTL could soon be back on our screens. The fight to resurrect those shows got a major boost when ABC recently secured the rights to those shows after a prolonged legal battle. Fans of the ABC shows can also do a great deal to ensure a reunion with our beloved Pine Valley and Llanview families. I would be over the moon if these two shows were back in tv. I was a faithful visitor to Llanview for over 20 years and Pine Valley for over 15. I’d pack up and move back! We agree, Susan! Love your enthusiasm! If you would be interested in/willing to be profiled in one of our Soap Cities reader profiles, that would be so great! Here’s an example of one. You can email me if interested at akbikhan@gmail.com! If you would be interested in being/willing to be profiled in one of our Soap Cities reader profiles, that would be so great! Here’s an example of one. I watched these shows the entire time they were on every day. Some of the best memories of my life are in front of the tv watching Murtle and Phoebe, Billy Clyde Tuggle and a slew of awesome, spellbinding characters. I now steer clear of all daytime television programs and only recently bought the Texas series, Dallas, in an effort to have my dose of drama in the afternoons. I would be so happy to see these shows again. We agree, Susan. Love your enthusiasm. If you’d be interested in being/willing to be in one of our weekly reader profiles, that would be so great. We wan to hear from passionate, positive AMC and OLTL fans just like you. Here is an example of our last reader profile. If interested, you can email me at akbikhan@gmail.com. Would love to see all my children back on ABC!!! Watched all my children since Erica was in high school and continued until they took it away:( any a d all updates are appreciated! We agree, Carole! You sound like a died-in-the-woold soap fan, which we at Soap Cities love! If you’d be interested in being/willing to be in one of our weekly reader profiles, that would be so great. We wan to hear from passionate, positive AMC and OLTL fans just like you. Here is an example of our last reader profile. Please bring these shows back the fans want what we want! The view and the chew need to go ! I’m ready to become an ABC watcher again if you bring these shows back! Ever since they got rid of these shows I have refused to watch any ABC program! And I’m pretty sure other fans have done the same! Love that passion, Jeannie. If you would be willing to be profiled in on of our reader profiles, let me know. See below for links where you can find previous reader profiles, and email me at akbikhan@gmail.com if you’re interested! Jeannie, ICAM!! I haven’t watched anything on the alphabet channel since the last day OLTL aired. I refuse to watch unless they actually bring OLTL back, not just use some of the characters to boost their pet soap. I would love these two soaps to come back even for 30 min episodes. I really miss watching amc and oltl. Please bring them back. Note: “Bring them back” is a great chant in case we must do a protest/rally at ABC headquarters again! Yes, Yes, Yes! Please bring them back! OLTL would have the best chance of coming back if they brought them back..
Few of the actors from AMC have passed away,and others are on another soap. I really don’t think they are coming back.. I really like if they could bring them back. I would love to see All My Children back on the air! I’ve been watching since the start. These characters are like family to me! There is no chemistry like Jack and Erica’s! No one can forget Tad and Dixie, the soul mates. Please bring them all back!! They ARE like family, right? That’s the thing. We can’t just accept that our family was snatched away from us because of bad business decisions. I watched both of these shows since the first day they aired and would love to see them return. That’s a long time, Muriel. I’m sure you felt very close to the shows and the characters. And you will again when they return. Yesss please! These soap operas were such a huge part of of my life! I watch it religiously from the age of 7 till 33. So When they got taken off the air it was devastating! It truly was like losing a family member! Those soaps was one of my huge stress relievers!!! SO HELLL YEA I WANT THEM TO HAVE A COME BACK! They are totally like going to therapy, soaps. And we love that fighting attitude! Thank you, Kathie. Will correct the mix-up. I knew that. Just mis-wrote. But thank you. I would be ecstatic if these shows were brought back. I was so disappointed and depressed when they went off the air. For Many yrs I watched Ch.7 from 12:30-4:00. All the soaps. I was completely Lost when it ended but I kept watching GH. I have been watching GH for 50yrs. I pray this comes about!!!! We watched 1230-4 too for so long. I was lead to believe that the shows were canceled due to low ratings as well as low viewer ship just like GL & ATWT. There’s talk of bringing GL back too. It’s much more complicated than low viewership, we believe. In an interview with Grant Alexander (Phillip, GL) he stated that, before his death, former GL Executive Producer Paul Rauch was EXTREMELY close to getting Guiding Light back on the air. I would feel like I died and went to heaven if AMC would come back. I have been watching it since the first day in 1970. Taped every episode, when VHS came out, and saved all the anniversary episodes. Still have them. Have AMC books and even AMC playing cards. Yes, I was obsessed and proud of it. I hope this is not a tease. Please bring AMC back!!!!!!!!!! It’s not a tease. We don’t do that. We report things honestly and accurately, and if something is speculation or just what we want to have happen, we say so. Promise. Literally! I still sometimes listen to the opening credits from just before cancelation b/c there’s something heavenly about them and the show! Oh Christina, I hear you! I have two anniversary books, VHS tapes of the best weddings, and when I get too homesick, I tune in to YouTube and catch snippets. I enrolled in Hulu and wanted so strongly for it to succeed. I’ll be waiting with the rest of you, hoping someday they’ll return to television. IHave seen some of the actors on general hospital and other shows which is great. But would love to have amc and oltl back again miss those shows. OMG, those Karen Wolek scenes! So amazing. AMC, OLTL, Really? YES? When? I can’t wait to see my two Favorite Soaps come back on. I have wonderful memories of sitting with my Mother watching ABC Soaps when I was a young child on up. I still remember Tara. Bo, Nora, please come back on. It has been really hard without OLTL. YES< YES, YES!!!!! Please bring them back. I feel like a lost a lot of friends when these two shows went away. I miss them still !! I would be ever so happy to see them back!!! I would love to have both of the soaps back on with the old cast.